Retractableawnings.com® offers the largest online selection of trim/binding/piping colors in the USA, Canada, Hawaii, Alaska, Puerto Rico, Guam and all Caribbean countries. You have a choice of any 1 of 26 solution dyed acrylic braid binding trim / binding / piping colors for the bottom of the valance. The binding is approximately 1/4" wide and is sewn with Tenara® thread (lifetime warranty) onto the bottom of both sides of the valance. The trim / binding / piping takes the shape of the valance style selected. This trim is used on all valances for all retractable folding lateral arm awnings (Venezia model excluded) and retractable canopy awnings. Important Note: We have made an effort to provide solution dyed acrylic trim images that closely represent the solution dyed acrylic trim colors. However, due to all the possible variants -- light source, monitor quality, etc. -- we cannot guarantee that the fabric images accurately represent the true and exact trim colors. 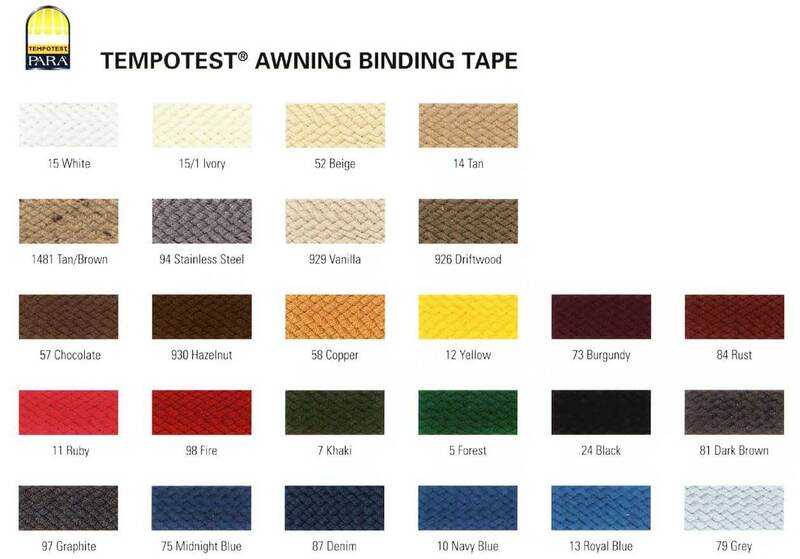 Please take this into consideration if you are trying to coordinate colors of the retractable awning awning trim / binding / piping with that of the retractable awning fabric cover.